Let’s face it color can make or break a room and choosing it can lead to bold choices that don’t quite work out or, the opposite—a conservative choice that doesn’t do much at all. Other times, trying to choose color can stop the process in its tracks through indecision. Not only that but that fear and/or dread around choosing paint can create problems that are often not seen until the project is completed and furnishings are in place. Although the physical act of painting the room should be done before furnishings and other elements of a room are installed, people don’t realize that choosing paint is last step in the design process. This of course seems counter intuitive. But if you look at it from a budgetary or availability-of-resources perspective it’s best to choose paint color after everything else is selected. When designing a room or a set of rooms it’s important to start with the most limited resources first: furnishings, lighting, floors, carpets or rugs and window treatments. Availability of items like sofas and chairs, tables or art can be finite and a budget can limit what items or what type of things can be put together in combination. In contrast, paint is your most abundant resource. It’s cheaper to buy than a sofa or rugs and a lot of colors are available. Not only that, it’s much easier to choose a color of paint once you have all the other elements in place to work with. That seemingly infinite number of color choices is quickly reduced once the empty room with bare walls has an ensemble of elements to work with. Having that in place makes it much easier to choose your paint. Not only that but light and lighting can change the color in a room very quickly. Outside light from windows and the direction that light comes from will effect the overall color of the room. Lighting from lamps or overhead lighting can counteract or change the hue or light temperature of a space. That additional dynamic of light and color makes it even more important to choose the wall colors last in the design process. So, what color should you choose? Most people don’t have the time or energy to think about all the moving parts of putting a room together. And most people do start with choosing the paint color first. As we mentioned above, these choices can lead to bold mistakes or conservative choices that fall flat. Working with a designer alleviates the fear and prevents those mistakes. A designer looks at all aspects of a space and creates a plan. Color, texture, light and volume all come into play when designing a room. Designers can make small, cramped rooms feel much larger or large rooms more intimate by using the process of design. This takes the fear out of choosing paint and ultimately creates a space that you love to be in. Do you have questions? Ask us your interior design questions. Go to our Questions page. There, you can leave us your question and we’ll get back to you with our answer. In our first post for the new year, we wanted to review a project that we did in this past year, one that we’re very proud of. Often we get called in to solve problems and discover that the solution was much different than our clients ever imagined was possible. 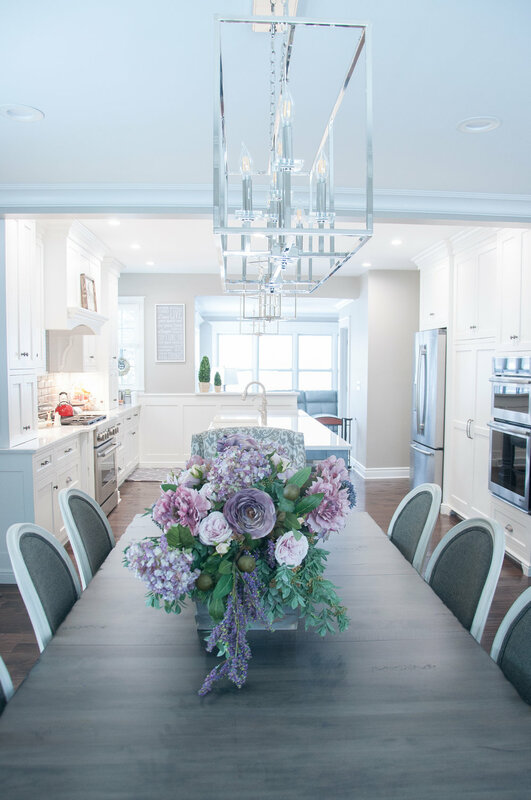 In the case of this project, we transformed a home with a more traditional layout and separation of rooms to an open concept home with more flow and open sight lines. Our clients were at a crossroads, they weren’t sure whether they should sell their home and buy a new one or renovate what they had to get what they wanted. They had lived in the house for some time and lived with things that they didn’t necessarily like. In some cases they tried to solve problems themselves but with mixed results. Although we only worked on the first floor, this project was a big renovation and one in which we were able to bring in a lot of the residential services that we offer to our clients. The first order of business was to open up the space. The house was from another era and rooms were separated which didn’t allow for the kind of flow contemporary homes provide. This made it hard to entertain and to live a kind lifestyle people are accustomed to today. In this case, the kitchen and dining room were cut off from the living room by walls, walls with doors, but walls all the same. A fireplace was at the center of all these rooms and we decided that this was the place to start. We proposed opening up the space around the fireplace so that someone could see the dining room and kitchen from the living room, and someone in the kitchen could see the other two rooms as well as anyone in them. At the same time, the fireplace, which after the renovation became a see-through fireplace—remained the central element in the house but didn’t dominate the space. To do this we needed to take out the load-bearing wall which separated the living room from the dining room and kitchen. This is where the multitude of services we offer came into play and allowed us to provide a solution to what we proposed. Our construction crew installed steel beams to replace the wood headers which allowed us to take out the wall that blocked light and views and the sense of space found in contemporary homes. The next step was to address issues in the kitchen. Like a lot of kitchens this one suffered from lack of light and a lack of workflow. Two key things helped remedy these issues. The first was to remove the wall between the back porch and the kitchen. Previously, our clients enclosed the porch with windows which brought in great light but only for that room. By taking out the wall between the porch and kitchen, the space felt lighter and more relaxed, and natural light flowed into the kitchen to create a brighter space. With the light streaming into the kitchen from the porch, we could now close off a small window that looked out toward a neighboring house and didn’t provide very good light. But by closing off the window, more space was available to work with in the kitchen and a new home for the stove and hood was found. We then placed an island with a sink and bar to gather around, sit and eat. The circulation in the kitchen became much better and the mood of the room changed, making it a more inviting space to be in. In all the work we do with our clients we present options and information that allow them to make the decisions and this project was no exception. Many decisions had to be made about materials, colors, textures and about what stayed in place and what had to go. Working with our clients on this project, we pushed boundaries of space and comfort zones which created surprising and pleasant results. All in all our clients were thrilled with their new space. People who knew the house from previous visits, didn’t recognize it. Guests old and new visiting during the holidays loved the results and the feel of the new space. What are some of the issues you’re having in your home? Are you at a similar crossroads and ready for a reboot? Or, are you looking to just freshen up the look of one or two rooms? In any case, we can help you with making your current or new home into a place that feels right for you. Check out our Services Page and Contact Us for a consult. Looking to do some last minute sprucing up before the holidays? We're holding a flash sale starting today, Tuesday, December 4th, through the end of the day on Thursday, December 6th. We're offering 50% off a selection of beautiful (and festive!) floral arrangements, mirrors, & furniture. Click here to see what's available! All items can be here by Christmas, but quantities are limited -- so make sure to act fast! To purchase any of these items or to schedule a one-on-one consultation during Workshop Wednesday, please email us at angela@angelanolfi.com or call 724-816-7144. P.S. We're going to have more flash sales featuring some of the different manufacturers & styles that we carry -- stay tuned to see what's next! Hi everyone! I'm Angela, owner of Angela Nolfi & Company and lover of all things interior design. I’ve been an interior designer in the Pittsburgh area for 27 years. During that time, I’ve worked on a lot of homes -- creating beautiful, functional, and comfortable designs for my clients. So why a blog? I wanted a place to share some of my tips, tricks, inspirations, and successes with you in hopes that they’ll spark your own imagination and creativity. Whether you’re starting out in the design field or looking to make a change in your own home, we can all do with a little extra support and stimulation. Here’s a little about me: My love of interior design came out of my fascination with art growing up. Crayons, sidewalk chalk, clay, pencils -- if I could use it to create, I did. My passion for doodling transformed as I got older into an array of eclectic works of art: a painting of an angel that resembled a bumblebee (created during my elementary school years), a clay bust of Lionel Richie, a watercolor painting of onions, just to name a few. As my love for the arts grew, I knew that this was something I had to make into a career. So I went to college and majored in Fine Arts and Interior Design. And that was it, the path I was looking for. Interior design allowed me to continue creating and support my family at the same time. Immediately after graduation, I started my own business. While living abroad for a few years, I created designs for foreign governments -- making a variety of renderings, space plans, and elevations. When I returned to the United States, I started working on window treatments and residential wallpaper projects. As my business grew, I wanted to make sure that I could provide the best customer service and pricing possible for my clients. I now have more than 200 in-house manufacturers available through my company, meaning I can confidently assist my clients in finding exactly what they need to make their house a home at the perfect price. What’s even better is that my daughter, Alessandra, has joined me to bring her own expertise and creativity to our designs. 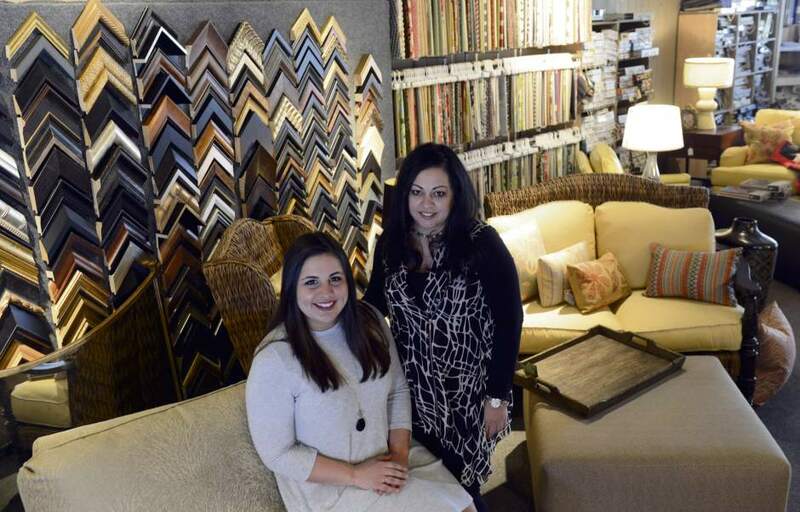 She started with me on the retail side of my business at The Monkey’s Trunk (my previous storefront) and has now completed her degree in Interior Design. Alessandra has always been interested in design going all the way back to when she was a kid designing impeccable homes in “The Sims” world. Her unique style and flare encourages our clients to explore options they may have never considered. You can see their excitement when they discover something new that they absolutely love. And, on top of everything, it’s great having my daughter around to collaborate with! I have so much to share with you about design, about my company, and about the do’s and don’ts I have learned throughout my career. I hope you’ll visit this page often to learn more and find your inspiration! This is a pretty important starting point when talking to any interior designer. However, it's only the tip of the iceberg -- if we’re going to help you design the perfect home for your family, we need to dig deeper and learn more about how you live and how you want to live. And that means asking the right questions. Who lives here? Finding out who uses this space is our first priority. There’s a huge difference between creating a design for a family of four with two small children and a design for a bachelor. This goes beyond color scheme. If you have tiny children running around, we’re going to want to steer clear of the crystal (at least in places where it can be easily knocked over). Which leads to the second question: how do you function in your space? Do you eat breakfast standing at the kitchen counter before your commute? Do you work from home? Are you up early to get the kids ready for school and need space to plan out lunches? While this is admittedly more than just one question, finding out how you use your space is crucial to making your home work better for you in those everyday moments. Do you entertain? 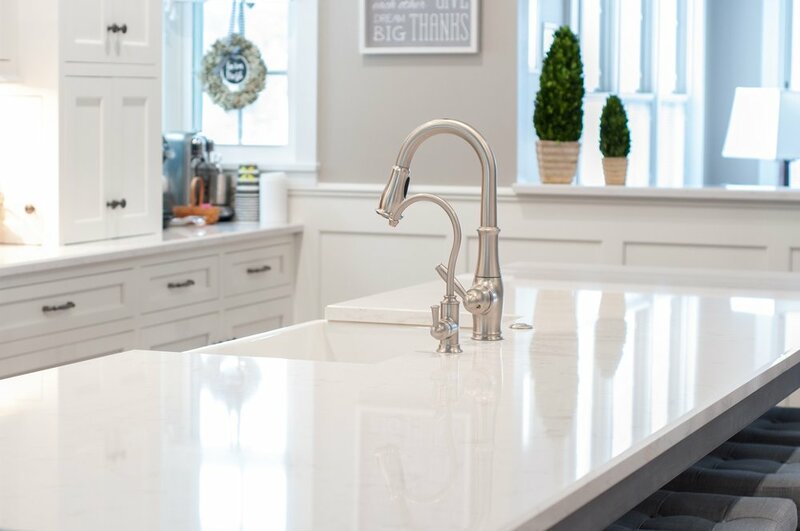 Making sure that your kitchen, dining area, and living room meet your needs during the holidays or other gatherings (when life can seem a bit more hectic than usual) is key to a good design. Running into things while trying to make a good impression on your in-laws or boss is not the kind of stress you need. What’s staying and what’s going? Not everything needs to be replaced when you decide to redesign a room. That lamp that you’ve had since you were a kid or the family heirloom shoved in a corner can have a new life in a well designed space. Re-using items can also cut down on the overall cost of a project. What is the timeline for this project? Or, exactly how much time would you like to spend with us? All right, so spending time with us may not be the deciding factor (though we are good company). We need to plan around any upcoming holidays, get togethers, or house guests. We want to make sure that you can put your best self forward for those moments in your life that matter most -- the time spent with family and friends. And the big question -- what’s the budget? You may not know the answer to this question, or you may be afraid to even approach the question. But we can help. With over 200 available in-house manufacturers, we have something for every budget. While this question is important in the grand scheme of things, figuring out the scope and scale of the project comes first. We’ll work with you to create a project that fits your budget and needs.